Insurance premiums are soaring. The latest figures from the CSO show that average motor insurance premiums leaped by 32pc and home insurance premiums by 9.5pc in the 12 months to the end of March 2016. So who is responsible for these runaway premiums? Any attempt to answer this question immediately triggers another round of the blame game with the insurance companies, Injuries Board, legal profession and government all pointing fingers at each other. Last week it was the insurance companies who were in the ducking stool. A Department of Transport memo released under the Freedom of Information Act stated that: "Motor insurers are now imposing higher premium rates to return themselves to profitability or to boost profitability after a number of years of insurers competing for market share, with prices driven down". The memo questions the usual reasons advanced by the insurance companies to justify soaring premiums; high Irish court awards, the level of Injuries Board awards, legal costs and the 2014 increase in maximum Circuit Court awards from €38,000 to €60,000. The Department of Transport memo argues that information provided by the Injuries Board "paints a somewhat different picture" to that portrayed by the insurance industry. So are the insurance companies crying wolf? If things are so bad why are they staying in the Irish market? Since 2004 all contested personal injuries claims must first go through the Injuries Board. In 2015 the Injuries Board made 11,734 awards (of which 75pc were motor claims) with a total value of €268m, an average award of €22,878. The average Injuries Board award rose by just 1pc in 2015. Despite the fact that the Injuries Board does not pay legal costs, 90pc of those making a claim were represented by a solicitor. However, the cost of processing Injuries Board claims was just 6.5pc in 2015, an all-time low. How does one explain this apparent disparity between Injuries Board awards and insurance premium inflation? "We have asked them [the insurance companies] to clarify what is going on in the world of claims. Basic information; the number of claims, the average settlement, the costs of settlement, the time to settle. This information is made available in the UK through the Association of British Insurers," says Injuries Board chief executive Conor O'Brien. Claimants are not legally obliged to accept an Injuries Board award, with about 40pc of awards being rejected. So does the problem rest with the courts instead? 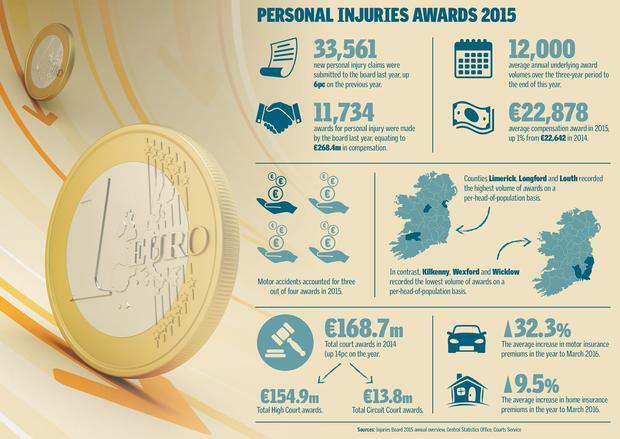 In 2014 the High Court made €154.9m of personal injuries awards with a further €13.7m being awarded by the Circuit Court, a total of €168.6m. This was up 14pc on 2013. A sizeable increase, but one that comes nowhere near explaining the rate at which motor insurance premiums are rising. One also needs to bear in mind that the High Court award totals are skewed by large awards in medical negligence claims, which of course have nothing to do with motor insurance. "The insurers slashed premiums, undercharged and under-reserved as a result, drove competitors from the market (e.g. Quinn, Royal Sun Alliance and Setanta) and now, with far less competition, are massively increasing premiums on the backs of the long-suffering motorists", says Law Society chief executive Ken Murphy. "It is outrageous that they are completely unjustifiably seeking to blame lawyers and claims costs. This is a complete red herring. In no way do any changes in these costs justify premium hikes of 20pc, 30pc or more in annual premiums." But with legal costs adding up to 60pc to the cost of a High Court award, surely they are at least part of the problem. "Legal costs play practically no role. The vast majority of claims are handled by the Injuries Board or are settled directly by insurers. No costs are payable in those circumstances except by the consumer. The tiny proportion where proceedings are issued are subject to ever-decreasing levels of costs by the stringent taxing regime [by the Taxing Master, a court official who adjudicates on legal fees], shortly to be strengthened by even more transparent and onerous legal costs requirements under the new Act", says Mr Murphy. So rising premiums are all the insurance companies fault then? Perhaps not entirely. A November 2015 review by the Central Bank, which regulates the insurance sector, found that the average cost of motor and public liability claims rose by 8pc between the end of 2012 and 2014 while the cost of employers' liability claims rose by 27pc over the same period. The Central Bank also noted an increase in the frequency of insurance claims with an average increase of 8.3pc in motor claims being recorded in 2014. Michael Horan, non-life manager of Insurance Ireland, points out that the average cost of settling an individual High Court claim rose by 34pc in 2014 while the average cost of settling a Circuit Court claim rose by 14pc. Based on Court Service figures, it would appear that the average High Court award was €304,000 and the average Circuit Court award was €13,550 (plus legal costs) in 2014. Unfortunately, the Courts Service doesn't break down personal injuries awards by category but, even if one assumes that the majority of the 56 High Court awards in excess of €500,000 were medical negligence claims, there were still 49 awards of between €200,000 and €499,000 and a further 171 awards ranging from €60,000 to €199,999. Based on what we already know about Injuries Board awards, at least three-quarters of these awards would have related to motor insurance claims. While High Court awards represent only a tiny proportion of all awards they tend to set the tone for other, smaller awards. Mr Horan points out that Irish personal injuries awards are very high by international standards. Irish whiplash claims settle for an average of €15,000 as against just €5,000 in the UK, he says. But, getting back to the point raised by the Injuries Board's Mr O'Brien, where is the data to support this claim? "At the moment we are pro-actively working with the Government on standardising data. The insurance companies provide a huge amount of data to both the Central Bank and the Injuries Board", says Mr Horan. Somehow one can't help feeling that the insurance companies' cause would be helped rather than hindered by greater disclosure on their part. At the very least the current system of incomplete disclosure of data leaves the insurance companies open to the accusation that they are being selective in the data they disclose. The Law Society's Mr Murphy is highly sceptical of the some of the assertions being made by the insurance companies. He accuses the insurance industry of operating a "huge propaganda machine". "They [the insurance companies] are constantly blaming everybody but themselves. They have no explanation but to blame someone else", he says.